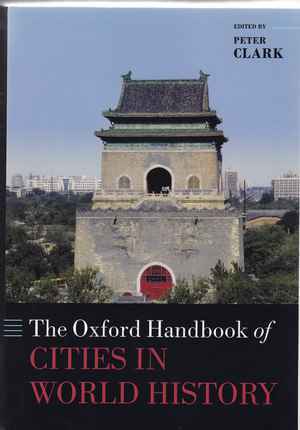 The Oxford Handbook of Cities in World History. Surveying several millenia of history of all things urban everywhere, the 850-page Oxford Handbook of Cities in World History, available since 2016 in a more affordable paperback version, inspires awe. The cumulative breadth and depth of the volume’s forty-four chapters, divided into three chronologically organized parts, makes even a perfunctory reading a steep learning curve. It is hard to think of another book that crams so much of what is there to know about the history of cities between two covers, and with such unassailable erudition. But how much of it can, or even should, the attentive reader retain? If the proof of a pie of this size is in the eating, this one is a feast for readers hungry for pure knowledge. Digestion, alas, is another matter. It is admittedly unfair to judge a handbook by the standards of a monograph. As far as the former go, many chapters of this volume can be put to excellent use in history seminars, not necessarily about urban history only. If you teach, say, Southeast Asia’s age of commerce or the comparative economic history of China and Europe, you would do well to scan the corresponding chapters. Most of the fifty-five contributors (several chapters are co-written) are long-term specialists of their topics as well as senior scholars, inclining them to take a broad sweep at their assigned topics, which in themselves are vast. This survey character of even the individual contributions increases their canonical appeal and often makes them usable for undergraduate seminars, too. Of course, there are plenty of alternative readings you can assign for that same purpose, not least by the same authors assembled in this book. Perhaps sensing the corrosive effects that the information age has had on the usefulness of printed encyclopedias and handbooks, in his introduction editor Peter Clark declares that this one intends to be neither: “There is no idea of offering an encyclopedia of urban developments” (1), he states, since even this “Handbook cannot hope to offer a definitive or comprehensive view of global urban history” (21). And yet, the rationale of organizing the tome into three chronological blocs of “early cities,” “pre-modern cities,” and “modern and contemporary cities”—each of which is subdivided into chapters covering either one world region or one theme, such as economy, migration, or power—suggests precisely the goal of comprehensiveness that once was the distinctive hallmark of world history. The all-in approach raises the bar for the volume as a whole to ask a consistent question and deliver a coherent argument, all the while Clark invites the reader to judge the enterprise by exactly that benchmark. Considering the difficulty of this self-inflicted balancing act, the handbook succeeds remarkably well. Although, with the exception of a few especially insightful chapters, the individual contributions are not comparative in themselves, Clark’s introduction does lay out a comparative framework for the volume as a whole, in which each constituent part should contribute to surveying “urban trends.” If this has to be reformulated as a question, it boils down to asking why societies urbanized over time. Imposing admirable discipline on his army of authors, the answers do reveal patterns recurring across time and space: political stability (or centralization) and technological innovation help, as do declining mortality rates, liberal migration regimes, and intensifying trade. The adoption of such a wide lens and the foregrounding of the question of urban growth rest on subtle assumptions of how urban and world/global history should be done; or perhaps more importantly, combined. These premises are less self-evident today than the unsuspecting reader can glean from Clark’s introduction. As for urban history, the macro-approach that the volume pursues entails two outcomes: First, it broadens coverage in time and space, foraying into areas that urban history, in its institutionalized form, has long neglected. Urging urban historians to engage more fully with pre-modern cities and with those beyond Europe and North America is in itself an important task; and one that this volume helps advance in a significant way. Second, however, the bird’s-eye perspective forecloses the microscopic attention to specific places and their inhabitants that most urban historians proudly cherish. Individuals and their everyday experiences unavoidably fade into the background in a handbook of this breadth. In the final count the question of how this tome approaches urban and world history really matters only if you read significant parts of it in search of an argument. Even with the reduced paperback price, neither editor nor publisher can realistically hope for such leisurely readers of a multi-authored 850-page survey. More plausibly they can assume the classroom use of different individual chapters across a wide range of courses in various disciplines. The handbook entirely fulfils this purpose by providing something like a canon concerning the huge arc of world-historical urban growth, neatly dividable into more digestible chunks expertly dealing with a particular world region or theme in one of three eras. Michael Goebel: Rezension zu: Clark, Peter (Hrsg. ): The Oxford Handbook of Cities in World History. Oxford 2016 , in: Connections. A Journal for Historians and Area Specialists, 14.07.2018, <www.connections.clio-online.net/publicationreview/id/rezbuecher-25945>.